Fwd: from Josh Buchin, CNS Rabbinic Intern: "On the loss of Naftali Fraenkel, Gil-ad Shaar, and Eyal Yifrach"
CNS Preschool! || Rabbi Creditor's Blog! It is with great sadness that I share with you the news that the bodies of Naftali Fraenkel, 16, Gil-ad Shaar, 16, and Eyal Yifrach, 19, were found north of Hebron in the West Bank. This is not a political note. This is a human note. I am writing because three innocent children were killed, and our world, our community, the prospect of peace, now all seem less hopeful. We are human beings and we should mourn and mark the loss of other human beings, always, but especially when the circumstances are as tragic and unwarranted as these. may be the lot of those young men. I am struck by the line in the above prayer wherein we ask that reality itself be turned around. According to the early news reports, the three were killed shortly after their abduction, on June 12th. In order for the prayers we had offered to have been effective, we would literally have had to turn around the laws of time and space to bring our children home. And yet, even a request such as this is insufficient. We should be able to do more, and yet we can't. All our prayers, all our vigils, all our tears. Still loss, still pain, still death. The loss created by these deaths will reverberate throughout our community and in Israel. Friends will mourn, parents will be inconsolable. But life will go on. It is easy to become anesthetized to all of the loss that occurs in life, reported by some periodical, transpiring on some distant continent. I am asking you to please not let yourself become numb to these deaths. I am asking you to feel these losses, to take a moment, a breath, two breaths, and acknowledge what these deaths mean to their families, to their friends, to their communities. To our families. To our friends. To our communities. To us. These were children. These were our children. HaMakom Yenacheim Et'chem Betoch She'ar Aveilei Tziyon VeYerushalayim. May God offer comfort to their families, friends and communities, and to all who mourn for Zion and Jerusalem. Typically translated as ‘Fear of Heaven’ in the context of confronting a situation with seriousness and integrity, Yirat Shamayim should be experienced as a charge to the human community that wishes to stand in awe of God – not to sit down and wait for a Divine voice, but to actively seek the Awe of God. This is a rejection of the “lo bashamayim hi” approach to halachah that ultimately creates a human legal system which excludes God’s voice. Conservative Judaism and all its close cousins are called to exercise a holy perogative with prudence and integrity. God’s will might be, as Rabbi Mordecai Kaplan (and Kevin Smith in “Dogma”) suggested, what holy people say it is. But that needs to be reversible as well. WE must make sure we are thinking about God when we put words in Her mouth. from my neighborhood walked by. Their hijabs made me pause. but in our lands of promise? • More than 1.2 billion people around the world live in extreme poverty. • Every year, poor countries lose more money to tax avoidance than they receive in aid. Here is something that should shock a citizen of the United States just as much: Current U.S. law enables this economic inequality. I recently returned from Washington, D.C., where I joined the interfaith, bipartisan anti-poverty group Jubilee USA and other faith leaders and small-business owners from across the country to encourage our elected officials to reform the tax system and protect the most vulnerable among us. Perhaps what surprised me most was that even legislative allies in the efforts to repair the fabric of our nation's economic inequality feel immobilized by the enormity of the task. To the paralysis, often experienced when confronted with big problems, I offer this faith response, culled from centuries of Jewish tradition: Ours is not to complete the task, but neither are we exempt from starting the work today. I expressed to our elected representatives that whatever they think about taxes, we should have a tax system in which everybody pays their fair share. To me, this is one of those issues where Republicans and Democrats can — and must — agree. It makes no sense to have legal loopholes that allow big companies to avoid their share of taxes and then pass the burden on through reduced services and increased taxation for the rest of us. In the United States, tax haven loopholes cost an estimated $90 billion in lost revenue each year. This is an enormous problem with enormous consequences, experienced in every strata of our nation. In the developing world, the problem is even bigger. During my trip to Washington, for instance, I learned that for every $10 poor countries receive in aid, they lose $15 because of large companies not paying their taxes. We heard the story of a woman in Zambia, who works 15 hours a day for $4, but who regularly pays a higher percentage in taxes than the enormous European-owned sugar company operating in her town. That company uses a web of "shell companies" and tax havens to avoid paying taxes. That means reduced funding for health services for the people of Zambia. These travesties, what my faith would call sin, is that all of this is legal. An even greater sin would be our silence as citizens. While in D.C., I learned that every month, in that same town, two children die of preventable malnutrition. The prophets of the Hebrew Bible would be standing on street corners, crying out in rage, calling out in the name of God for the most vulnerable in our society to be lifted up. It isn't only a religious obligation to care for our sisters and brothers by legislating societal responsibility into the tax code — it is common decency. As a person of faith and a concerned citizen, our current situation deeply saddens me, and moves me to action. We need to pass laws that make it harder for companies to use tax havens and harder for both tax avoiders and criminals to hide their activities through the use of anonymous shell companies. Not only will this save U.S. taxpayers money, it will help eradicate poverty in desperately poor communities and give law enforcement the tools it needs to catch criminals — including terrorists and drug dealers. I pray my representatives take my words to heart. If they do, they'll soon have a chance to prove it. Congress is considering whether to renew two offshore tax breaks. If Congress simply does nothing, these harmful loopholes will be gone from the tax code and we'll all be better off. Perhaps even the pattern of inaction in the halls of Congress can be redemptive in this way. Unfortunately, I know our representatives hear from an army of lobbyists working to defend the interests of powerful clients. But it's not too late for our officials to do the right thing. We must be an army of angels calling out for the most vulnerable in our country. There is no other just way forward. Rabbi Menachem Creditor is the spiritual leader of Congregation Netivot Shalom in Berkeley, Calif., an executive council member of the international Rabbinical Assembly, and editor of "Peace in Our Cities." This op-ed was provided by American Forum. We care, and because we care, we despair. Will there be any outcome for Israelis and Palestinians, for Israel and Palestine, in which both Peoples are acknowledged and respected? Where one group's national aspirations are not deemed unworthy? This is the conversation Josh wants to have, the conversation we believe we need. We need is as Jews. We need it as people. We need it as one People among many Peoples. Will there ever be a solution? We don't know. We worry. Everyone suffers when some suffer. And so someone who cares is convening a loving, respectful conversation with a very clear mandate: More hope, More dignity, More love. 1) If your position is that Israel should cease to exist as the Jewish Homeland, that is not the conversation we are going to have. 2) If you believe Jews are better than Palestinians, that is not the conversation we are going to have. 3) If you believe that only Jews have the right to a state, that is not the conversation we are going to have. 4) If you believe Israel's concerns about security are imagined, that is not the conversation we are going to have. Please contribute to our Jewcer Campaign to bring their teachers for 4 days of learning the best new ideas at NewCAJE this summer! We want to help every child in every classroom to be a champ! Please contribute to our Jewcer Campaign to bring their teachers for 4 days of learning the best new ideas at NewCAJE this summer. An amazing CNS Shabbat: Great davening and Torah, celebrating an aufrauf of two precious souls, marking a sweet young person becoming bar mitzvah, hosting the HIAS Country Director in Uganda to learn about how we, as a Shul, can participate in refugee resettlement, and standing together praying for three kidnapped Jewish boys to be redeemed from captivity. It felt like the five years we prayed every Shabbat for Gilad Shalit were back, and the pain was and is just so deep. We are a special kind of shul whose members support New Israel Fund, AIPAC, J Street, Rabbis for Human Rights, FIDF, and others. But today we all left our politics behind and just held our boys in our hearts and wept as part of the larger Jewish family. All this is what makes our community so amazing. I knew, when I plugged back in, after Havdalah, that I'd see some continued anti-Israel comments on my social media platforms. But the magnitude, volume, and tenor was a harsh reminder that all is not well nor stable for Jews in the world. I deleted most of the hatred on my various media streams, but took a screen shot of a random selection and saved it as a reminder of an important point: there are some who believe that anti-Zionists are not anti-Semites. I reject the dichotomy, not because (politically speaking) a theoretical formula is impossible, but rather because the reality is that the two are conflated and overlap and are inextricably bound (which is how, as a religious Zionist I believe it should be in the first place). But my point is that, even if I believed they were separate, that "careful thinking" is eviscerated by the hatred of both. I could point to the Shoah as "proof" that the world sees Jews as an identifiable global People, but we need not go that far for evidence. All I had to do was turn my phone back on. 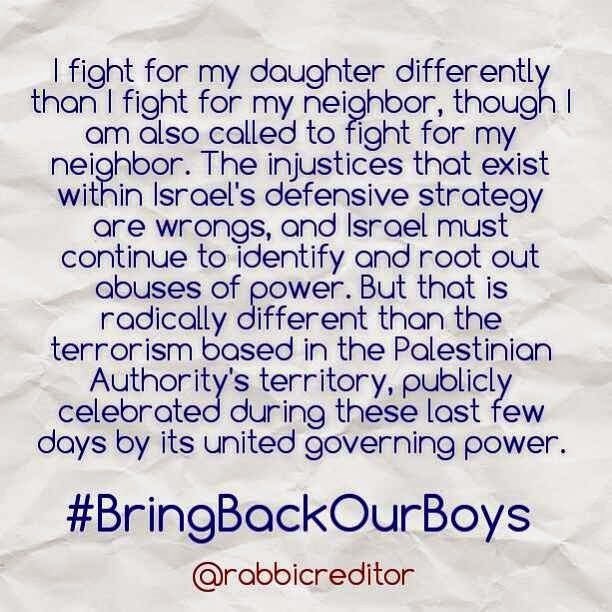 Even if we would (God-forbid), try to forget that Eyal , Naftali, and Gilad are our sons, their abduction and our hearts' collective ache remind us that their fates are bound with ours, and that reality trumps theoretical constructs every time. I highly recommend Ari Shavit's "My Promised Land," as its pain is all our pain. He doesn't let anyone off the hook. And his critique of the left's approach rang in my ears when I read some of the antisemitic comments on my social media streams tonight. My personal commitment to Two States for Two Peoples is well-addressed by his analysis, and I believe his critique of the messianisms of the "right" and the "left" when it comes to Israeli politics should be required reading for all Jews. But really, what I want more than sympathy for my discomfort at some online hate-speech is to #Bring Back Our Boys. We can soothe each other's wounds and sort out political theories later, once they're home. May Yaakov Naftali ben Rachel Devora, Gilad Michael ben Bat Galim, and Eyal ben Iris Teshurah be returned safe and healthy to their homes very, very, very soon. May all children be safe. As many of you have likely heard, three students of Makor Chaim Yeshiva went missing Thursday night in Gush Etzion. Their disappearance is being treated by the Shin Bet and the IDF as a kidnapping by terrorists, and a massive manhunt in now underway. Please consider saying a prayer (tehillim) for their welfare and safe return. We pray for our brothers of the whole House of Israel, who are placed in distress or captivity, on sea or dry land. May the Omnipresent be merciful to them, and bring them forth from distress to relief, from darkness to light, and from oppression to freedom, now, swiftly and soon. Two New Adult Classes with CNS Rabbinic Intern Josh Buchin! CNS Rabbinic Intern Josh Buchin! 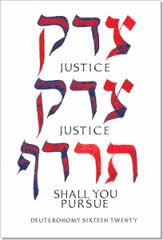 Biblical Ideas of Justice. What is justice? How do we create a just society? What morality animates the later books of the Bible? In this three part course, we will examine various stories in the Prophets and the Writings that explore the Divine mandate we have to build a better world. Participants are asked to register with Daniel in the Netivot Shalom office at office@netivotshalom.org. What responsibilities do we have for those in our community? How far do those responsibilities extend? How should those obligations extend in our lives? From the Torah onwards, Jews have been instructed to create sacred communities of inclusivity, compassion, and concern for those in our midst. Come and explore Biblical & Rabbinic texts that address the personal obligation to build with and for others. The scars of Jewish history have not obscured our Jewish souls and our Jewish commitment to life. The US is in the midst of a #GunViolence epidemic that makes God and every human being cry. We stand for life and call for an end to the #Gunsanity. Country Director of HIAS Uganda, speaking about the refugee organization's work in Kampala. HIAS protects refugees-including women and children, and ethnic, religious, and sexual minorities-whose lives are in danger for being who they are. Guided by our Jewish values and history, we help refugees rebuild their lives in safety and advocate to ensure that all displaced people are treated with dignity, regardless of ethnicity, religion, or place of birth. Please join us at Congregation Netivot Shalom (After Birkat haMazon, approx.. 1pm) to hear Devota Nuwe, Country Director of HIAS Uganda, speak about the refugee organization's work in Kampala. HIAS assists refugees whose lives are endangered because of who they are --including ethnic, religious, and sexual minorities, as well as vulnerable women and children. Guided by Jewish values and historical experience, HIAS helps refugees rebuild their lives and advocates for policies that protect the 15 million people worldwide who have been forced to flee their homes. Devota Nuweis a native of Kampala, Uganda and received her Bachelor of Law degree from Makerere University, Uganda and her Master's degree in Criminal Justice from the University of Kent, England. As a senior Protection Officer at HIAS, she manages operations and prepares cases for resettlement. Devota has worked with the United Nations High Commissioner for Refugees and the Office of the High Commissioner for Human Rights on forced migration issues. She has worked closely with South Sudanese refugees, and has also assisted internally displaced persons in Northern Uganda.